Editorial cartoonists often use humor to make a point about a serious situation. 1. What point is Sean Delonas making in his cartoon? 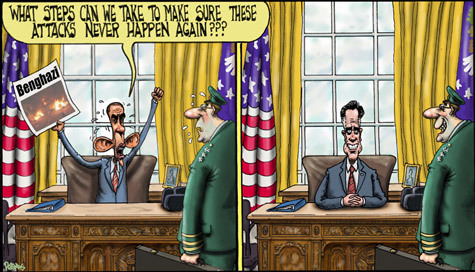 d) If Mitt Romney had been president during the terrorist attack on our consulate in Libya, the outcome would have been different. 2. Do you agree with Delonas’ assertion about the terrorist attack on the U.S. consulate in Libya? 1. d) If Mitt Romney had been president during the terrorist attack on our consulate in Libya, the outcome would have been different.